Some years back during the severe earthquake in northern Pakistan and POK while reporting on destroyed houses and sorrowing families there was a scroll ad running at the bottom of the TV screen: 'Purvankara homes, the best homes in Bangalore'. Then again you might see reporting on a terror attack and then you might have a commercial break and suddenly up comes the Cadbury ad saying 'Kuch Meetha Ho Jaye'. Insensitive stupidity is one thing, but outright greed and invasion of your time are altogether different things. And mindless greed has been the main principle of our mainstream media. If newspapers have turned their front pages into ad pages, the TV channels have gone many steps ahead. It is one thing to have commercial breaks during programs which, although annoying to the viewer, is a genuinely fair way of doing business, but altogether another matter when they force you to watch content. A commercial break warns you and you can switch channels or attend to something else. Mind you, lately the media crooks have also employed the tactic of turning up the volume during ad breaks so that no matter where ever you are in the house you can still hear the loud sounds. But that wasn’t enough. For more than a year now TV channels, particularly sports channels, have been airing commercial ads during the program itself. You could be watching a game of cricket, a documentary, a news discussion and suddenly you will be invaded by a PIP (Picture-In-Picture) ad, a pop-up ad or small banner type ads that suddenly flash across your screen. These pop-up ads are a fraudulent invasion of your privacy. The programs you are watching are not free. You pay for them. With these pop-up ads and flash banner ads the TV channels are FORCING you to watch content that you should not have to watch. In a commercial break you are aware of what is on your screen but these pop-ups force you to watch the ads because they are flashed in your face in the middle of the program. 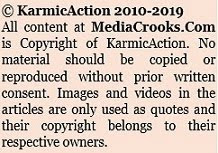 This is a fraudulent practice and both the ASCI and the Ministry of I&B must ban this practice to protect consumer interests. The least priority on the media’s list is the viewer. Sometimes these pop-up ads can take up as much as 25-40% of your screen. The biggest violators of this kind of invasion are sports channels. Pic 1 above is not an actual TV grab but used as a sample to demonstrate how pop-up ads take space on your screen during a program. Viewers have experienced these monstrous ads appearing on their screens frequently, forcing them to watch the ads when they shouldn't have to. This is not what you are paying for. Pics 2 & 3 above are from Ten Sports' live telecast of the India-South Africa test currently under way. 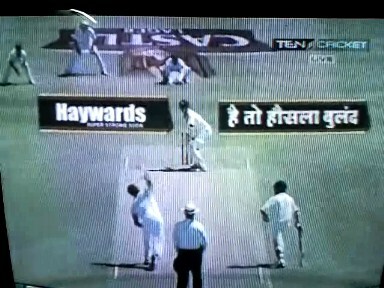 In the pic on the left the Haywards logos appear suddenly on either side of the wicket/batsman as the bowler delivers the ball. Is this legitimate advertising or invasion of your time and privacy? 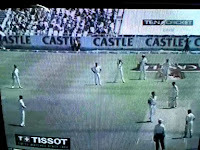 In the pic on the right the Tissot brand is flashed as the bowler is on the way back. 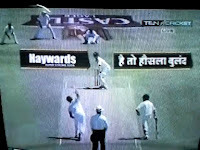 Mind you, Haywards happens to be an alcohol brand parading as a soft beverage. These are matches being watched by all age groups, including children. Such perverted advertising has to stop immediately. TV channels must be free to make money during their commercial breaks. No one would grudge that. However, they should not be allowed to make money on your time. That’s the time you are paying for. Viewers should start sending complaints to the Ministry of I&B to ban this fraudulent and invasive practice. I have doubts if Ambika Soni is ignorant of these malpractices. In the US the increasing of sound volume during commercial breaks by TV channels is banned. Scrolling commercial ads, pop-up ads or button-banner ads that invade you during programs you paid to watch should also be banned. I was under the impression the adv. volumes came inaudibly high and often censured my wife as she increased the same. Now I understand it is not her fault. Moreover the pops not only confined to TVs, comes even in system media news. For instance, go over to Yahoo news (very frequently with G5 of Nokia, ET news and even MSN is no less which gives irritation to go through the news items. We unite to condemn unequivocally such nuisance. Pop ups are the best thing that happened to me and my family in a while: I got so unbelievably annoyed by pop ups that one night there was a click inside me that made me stop watching TV altogether. Pop ups simply defeat the purpose of watching TV. Since then I can't believe the extra time I feel I have to myself - it's like I was plucked out of the Matrix: more time for the kids, I'm happier at home and at work, my quality of life increased noticeably, my wife and I have time for great connecting conversations, stress decreased (I don't have to do this and that before the show starts), etc. 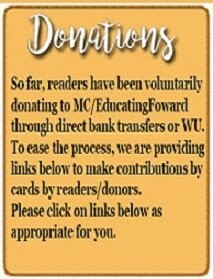 I now get the news from the friendly newspaper and watch DVDs instead... No pop ups there.